Katie says this is in the break room at Wal-Mart. I think the most ambiguous part of the sign is the elipses. What comes next? Did the writer die while making this sign? Actually, "No" Magazine is quite popular with the youth. I can see why they wouldn't want people to take it into the break room when it sells so well. @Kathleen: But they said that "No" magazines *are* to be brought in -- *unless* paid for. Figure that one out. 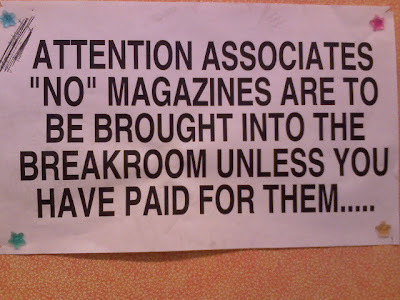 So if you have paid for your "No" magazine, you can't bring it in. @Jared: "No, it's more in the throat. Arrrrhhhhhhhh."